Between 1897 and 1914, Dreser worked for Bayer, the former dye factory that was to become the first of the world's pharmaceutical giants, in Wuppertal, north-west Germany. Friedrich Engels was born there. While Dreser made less of a mark on history, you could argue he had the greater influence on the 20th century. As head of Bayer's pharmacological laboratory, he was responsible for the launch of two drugs that have shaped the way we live: aspirin, the world's most successful legal drug; and heroin, the most successful illegal one. The centenary of heroin is more ambiguous: it was launched in November 1898 but was registered as a trademark in various countries from June that year, most lucratively in the US in August. But whenever the centenary falls, Bayer won't be celebrating. In 1897 the Bayer chemist Felix Hoffmann, acting on Eichengruen's instructions, discovered a new process for modifying salicyclic acid (a remedy for fever and inflammation which unfortunately has excruciating digestive side effects) to produce acetylsalicyclic acid (ASA). Eichengruen enthusiastically recommended ASA to Dreser in 1898. Dreser, after cursory consideration, rejected it. Ostensibly, his objection was that ASA would have an "enfeebling" action on the heart. "The product has no value," he pronounced confidently. But the real problem was almost certainly that he had another product on his mind whose impending success he was anxious not to jeopardise. This was heroin. But Dreser was the first to see its commercial potential. Scientists had been looking for some time for a non-addictive substitute for morphine, then widely used as a painkiller and in the treatment of respiratory diseases. If diacetylmorphine could be shown to be such a product, Bayer - and Dreser - would hit the jackpot. Diacetylmorphine was first synthesised in the Bayer laboratory in 1897 - by Hoffmann, two weeks after he first synthesised ASA. The work seems to have been initiated by Dreser, who was by then aware of Wright's discovery, even though he subsequently implied that heroin was an original Bayer invention. By early 1898 was testing it on sticklebacks, frogs and rabbits. He also tested it on some of Bayer's workers, and on himself. The workers loved it, some saying it made them feel "heroic" (heroisch). This was also the term used by chemists to describe any strong drug (and diacetylmorphine is four times stronger than morphine). Creating a brand name was easy. In November 1898, Dreser presented the drug to the Congress of German Naturalists and Physicians, claiming it was 10 times more effective as a cough medicine than codeine, but had only a tenth of its toxic effects. It was also more effective than morphine as a painkiller. It was safe. It wasn't habit-forming. In short, it was a wonder drug - the Viagra of its day. "What we don't recognise now," says David Muso, professor of psychiatry and the history of medicine at Yale Medical School, "is that this met what was then a desperate need - not for a painkiller, but for a cough remedy". Tuberculosis and pneumonia were then the leading causes of death, and even routine coughs and colds could be severely incapacitating. Heroin, which both depresses respiration and, as a sedative, gives a restorative night's sleep, seemed a godsend. There were heroin pastilles, heroin cough lozenges, heroin tablets, water-soluble heroin salts and a heroin elixir in a glycerine solution. Bayer never advertised heroin to the public but the publicity material it sent to physicians was unambiguous. One flyer described the product thus: "Heroin: the Sedative for Coughs . . . order a supply from your jobber." "It possesses many advantages over morphine," wrote the Boston Medical and Surgical Journal in 1900. "It's not hypnotic, and there's no danger of acquiring a habit." But worrying rumours were surfacing. As early as 1899, researchers began to report patients developing "tolerance" to the drug, while a German researcher denounced it as "an extremely dangerous poison". 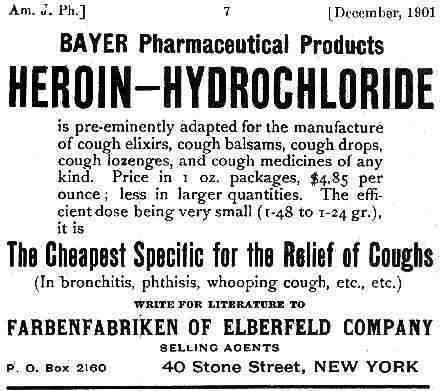 By 1902 - when heroin sales were accounting for roughly five percent of Bayer's net profits - French and American researchers were reporting cases of "heroinism" and addiction. The bandwagon took time to stop. Between 1899 and 1905, at least 180 clinical works on heroin were published around the world, and most were favourable, if cautious. In 1906, the American Medical Association approved heroin for medical use, though with strong reservations about a "habit" that was "readily formed". Had heroin been his only pet project, this disappointment could have spelt career disaster. Dreser had the kind of personality that needed commercial results to lend it plausibility. With his unfashionably formal clothes and his habit of dragging an overweight dachshund to work with him, he was seen as an eccentric loner, a "difficult" man whose ready sarcasm and autocratic manner meant he did not want for enemies. Luckily, although his first "baby" was showing signs of turning into a monster, Dreser had belatedly adopted another: aspirin. Eichengruen, refusing to accept Dreser's rejection of ASA, had continued to investigate it and to lobby for its development. Eventually, Dreser recognised which way the wind was blowing, tested ASA on himself (as well as on his laboratory of rabbits), and finally published an enthusiastic scientific paper recommending it, particularly for the treatment of rheumatism - but omitting to mention the contributions of Eichengruen and Hoffmann. In February 1899, the brand name "Aspirin" was registered, and in June, Dreser presided over its launch. Like heroin, aspirin more or less sold itself. As a painkiller without undesirable side effects, it was - and remained for decades - unique. By the end of 1899 it was being used all over Europe and the US, and by the time the heroin bubble burst, aspirin had more than filled the gap. Bayer was on its way to becoming an industrial giant. Hoffman and Eichengruen do not seem to have received any special compensation for their efforts. For Dreser, though, the rewards were spectacular. By 1914 Dreser was an exceptionally rich 53-year-old - so much so that he decided not to renew his contract at Bayer. When war broke out he moved to Dusseldorf as honorary, unsalaried professor of his own pharmacological institute at the new Medical Academy. Thereafter, the record becomes indistinct. His first wife died, there were no children and, it appears, few friends. There were rumours that he was addicted to heroin himself. Eventually, his health deteriorated. His last years may or may not have been happy. But they were certainly comfortable - which is more than can be said for Eichengruen, who, in his eighties, emerged from a concentration camp to write an unpublished denunciation of Dreser's "discovery" of aspirin. In 1924, health problems forced Dreser to give up his institute and he moved to Zurich, where he remarried. That year, the US banned the use and manufacture of heroin altogether, even for medical purposes. (In Britain, the medical use of heroin continues to this day, accounting for 95 percent of the world's legal heroin consumption.) The same year, four days before Christmas, Dreser died. The cause of death was given as a cerebral apoplexy, or stroke. It is just conceivable - had anyone known it - that he could have averted this fate by the simple expedience of taking an aspirin a day. If the rumours of addiction were true, the irony is doubled: Dreser, incorrigible in his misjudgment, had spent his twilight years taking a daily dose of the wrong wonder drug. But the appearance of heroin played a crucial role in cementing the link between drug abuse and crime. Pharmacologically, heroin has the same effect as morphine. But you need only about a quarter as much to get the same effect. It is also cheaper, quicker and easier to use. As national and international legislation against opiates gathered force after 1914, addicts who wished to continue their habit inevitably switched to heroin. By 1924, 98 percent of New York's drug addicts were thought to be heroin addicts. With legal channels of supply closed, criminal gangs - first Jewish, then Italian - began to monopolise the trade. By the end of the 30s, the Mafia was inextricably involved. Today, heroin use in Britain and the US is increasing faster than at any time since the 60s: heroin seizures rose by 135 percent between 1996 and 1997. There are thought to be between 160 000 and 200 000 heroin addicts in the UK, who spend almost R30-billion a year on heroin. And the British government spends R14-billion a year on drug-related policies. The other great change resulting from Dreser's marketing of a faster-acting and more conveniently consumed opiate has been a change in the profile of the average opiate abuser. In 1898, the typical morphine addict in Britain or the US was a middle-class woman in her forties, whereas today's typical addict is an 18-year-old male.